After a six-month break, our group of local beer bloggers, journalists, home brewers and industry leaders got together again for Beer Tasting Extravaganza: Big Bear Brewing Edition. Big Bear Brewing Company in Coral Springs was the host for the fourth meeting in our series after the Total Wine, Coffee District, and Abraxas Lounge Editions. I was of course the first to arrive. What a punctual and responsible beer citizen I am. I took the opportunity to case the joint and take some of the amazing photos you see throughout this article. This was our first event at night, so darkness definitely played a role in my photography. Hmmm. After an initial snafu where our fearless leader Ed Roberts told the surprised Big Bear owner that they were expecting us, we were seated out on the patio, which was otherwise empty aside from one other distant girls-night-out party. The gracious welcome by our charming host and the golden smile of our most hospitable waitress soon led us to believe all was right with the world. All 14-ish of us ordered dinner and some of Big Bear's beers, and the discussions, fun and serious, got under way. My first beer of the evening was Big Bear's Apricot Ale. Since there were many samples to come, as each of the attendees brought a bottle, I ordered the five ounce sampler. What a delightful beer this is! While the aroma only provides a light fruitiness, the flavors are really nice. Fresh and hoppy, plenty of apricot flavors, light and crisp and quite refreshing. Apricot Ale was a winning start! I hope this year's Dogfish Aprihop comes out as great as this one--a bold comparison that I have no problem making! Mixed in with the beer our group brought, Phil from DosBeerigos.com let me take a sip from two other Big Bear samples he had. The Big Bear Doppelbock was full of rich caramel and had a potent alcohol bite, pretty nice. And I really enjoyed the Big Bear Imperial Stout, served on nitro. Pure chocolate alcoholic YooHoo! Honestly, the lighting and angles for the pictures I took, despite multiple attempts, made my normal amateur work look even worse, so a few of these pictures come directly from the brewery websites. I'm guessing you'll be able to tell. The first non-Big-Bear beer we sampled was Dogfish Head Saison du Buff. 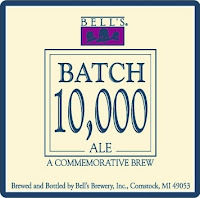 This is Dogfish's version of the beer also brewed by Victory Brewing and Stone Brewing. Homebrew Vanessa and Homebrew Brent brought this one to share. They were also nice enough to bring me a sixer of their home brews from the past six months since I haven't seen them in a while. 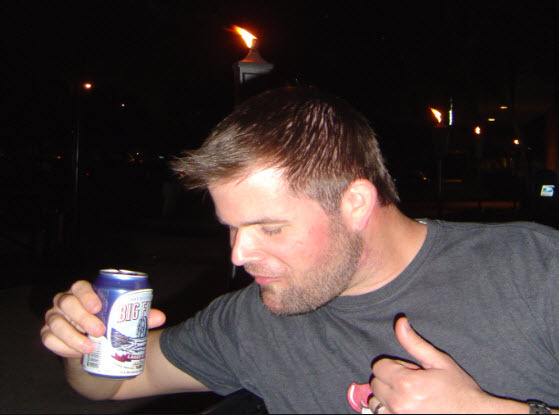 Haha-->Brent checked in with each of last night's beers on Untappd and didn't earn a single badge for it. Sucker! Anyway, these two will eventually have their own professional brewery. As for Saison du Buff, the aroma is quite interesting. Herbal, as in Herbes de Provence. Someone said rosemary, so yeah. A bit of a lemony aroma as well. The flavors are very subtle. A little spicy, a little citrus, creamy and fluffy texture. I might say bland, though. The yeast is very noticeable and so is the giant carbonation. Next up, Homebrew Vanessa's Rye Harvest Ale. Vanessa rambled on about Citra this and Cascade that. I was too busy drinking already. She also said that this beer rang in around 6% alcohol. Creamy with a spicy rye kick. Quite hoppy with plenty of citrus flavors. You can also taste the yeast. I hope this is one of the six she sent home with me! Great beer! Blue Point Toxic Sludge was next in the lineup. This is a Black IPA that Ian from Fresh Beer brought along. He said that 100% of the proceeds went to a charity to help oil-soaked birds. I heard someone else call this "BP Toxic Sludge"! Hahaha. Good one! Subtle caramel aroma. Bitter and malty flavor rolled into one. Hoppy and roasted, and not those harsh roasted flavors I hate. Thick body. Nice beer. I'm not sure who brought the next beer, Fantôme Black Ghost, but it might have been Mike from Bon Beer Voyage. His wife Ruth wasn't there last night. Just a theory, but I bet she was planning one of the many excellent beer vacations they put together. You should check them out as it sounds like a blast! The label says Noire de Noire. The beer was very cloudy with sediment. Sour berries and raspberries are the main attraction of this beer. The flavors are nice, though this lacked some carbonation. I could have used a little more sharpness as well from the flavors, though there was some spice. Dry finish. Ian and Ed said they tasted a lot of cardboard and that it was probably a result of some unintended oxidation. I didn't taste that, but I'll let you wallow in this Oxidation Geekdom that was my college life! Next up--Tröegs Dead Reckoning Porter brought by the lovely Phil from DosBeerigos. The photo of him enjoying the pure refreshment of Walgreens Brand Big Flats 1901 (see below) shows me why the guys at the Funky Buddha Brewery hired him. Seriously though, Phil is getting his ears wet at the brewery and learning a lot starting in the mail room. Eventually he'll be the CEO I'm sure! This beer has some roasted, nutty and caramel flavors, but is also kind of bitter. Thin body, normal, boring. That's about it. Update: Right after I published this, Phil wanted me to let it be known he isn't hired yet. Rather, he's volunteering and learning his way around a working brewery. 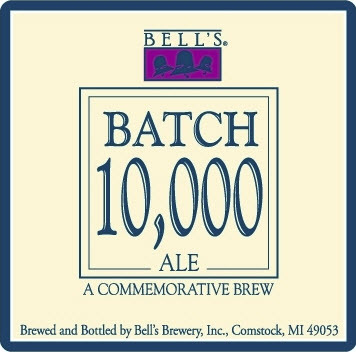 Bell's Batch 10000 was up next. Astringent, lemony citrus with some band aid to start. Plenty of alcohol to clean the wound as well, very warming. Caramel and burnt flavors toward the end. Ian said he tasted bleu cheese, which I seconded after a little thought and another sip of my one-ounce sample. Mike from MikeLovesBeer.com showed up just as we started. We thought his week-long sickness was going to keep him at home, but he powered through to join the gang, bringing Cigar City Sea Bass Farmhouse Ale with him. As he sat the bottle on the table for all to see, he said, "here's one from this 'underwhelming brewery'', which I correctly took as a quote of mine from a few weeks ago. Update: Mike told me afterward that it's not called a Black Saison. Well, I didn't make it up. Someone said that last night, but Beer Advocate has a quote backing Mike up: "According to the head brewer, this is not a "black saison". It is a "dark farmhouse ale". And it is not a collaboration beer." Then came Uinta Cockeyed Cooper Bourbon Barrel Barleywine. This beer was shared by Sally from BX Beer Depot . Bourbon, woody and nutty aroma. Sweet candy and sugar flavors develop into marshmallows in your mouth. The bourbon is clearly there, but is very smooth. The alcohol punches you but is not harsh. How is that possible? I don't know! Good flavors. John Linn who writes for the Clean Plate Charlie column in the Broward Palm Beach New Times is also a home brewer. He brought his Leftover IPA Home Brew for us all to taste. Named for using all the leftover hops he could find in his freezer, this beer is clearly hoppy, yet not overly so. Bitter but balanced. Citrus flavors are nice and flavorful. You end with a dry, bitter, cleansing finish. Ian from Fresh Beer brought his latest home brew, AGAIN with no name! I guess it's up to me. It is an imperial coffee stout aged for one month in a bourbon barrel. Light aroma, mainly coffee. Chocolate and coffee flavors to start, a little sweet and very smooth. Low carbonation. Bourbon and alcohol flavors with hints of vanilla show up toward the end. Ian said that he thought it would be a little hot, alcohol-wise, but I didn't feel that. That gave me an idea for a name. NOT HOT CHOCOLATE COFFEE STOUT. Update: After I published this, Ed jumped in to let me know that Ian's home brew was aged in Palm Ridge Reserve Florida whiskey barrels. And then Mike clarified further saying, "It is in the bourbon style but technicalities don't allow them to call it bourbon because it's made in FL." So there you have it. All the facts. I brought along two cans of the five I had left over from my Big Flats 1901 review last month. Despite the fact that everyone already knew it is a pretty bland and boring beer, almost everyone wanted to see what a $0.50 beer could taste like first hand. Except for Vanessa. She was all like, "I'm not gonna waste calories on that stuff!" Anyway, bland, grainy beer. Doesn't taste bad, just not really much of anything. The end. The real beer that I brought to share was Upland Teddy Bear Kisses. This was the final beer, number 8, from trade 2 with Marathon Marie. This is an imperial stout and the label depicts a scary little teddy bear sitting in a room with just barely enough light to see, the stuff nightmares are made of. Not much of an aroma. Smooth and alcoholic hot start. Chocolate with a hoppy, bitter balance. Thin body. Not that great honestly. Ed brought a bottle of Brooklyn Wild One, one of the rarest beers they brew and one that is not bottled. "Didn't you just say he brought a bottle?" Yes I did and thanks for paying attention. Someone from the brewery put it in the bottle for Ed, not for sale. I do believe I heard this is Brooklyn Local 1 with a wild yeast and aged on bourbon. Lemony, yeasty aroma. Subtle bourbon flavors, tart and sweet at the same time. The alcohol even feels a little wine-like. Yeast is prominent. Medium carbonation. I really like the subtle sweetness, and this was my second favorite of the night after Cigar City's Sea Bass. Again, I had fourths or fifths. Finally, Sally and Cory from BX Beer Depot brought He'Brew Lennys RIPA on Rye. I love the normal Lennys, so had high hopes for this one too. The rye is harsh and super prominent, and the flavors are total alcoholic whiskey. I did not like it, and I wasn't alone. At which point it began to rain. I was sitting by the edge of the awning so I had to move. Since we made an atypical bottle mess, something not normally found at Big Bear, we took that time to pour out any remaining unfinished beer and put all of our bottles in a garbage bag. The conversations continued for a while about American Craft Beer Week and Growler Laws until the rain stopped. We all paid our checks and got out of Dodge. If you're in the neighborhood, check out the extensive menu and great beers from Big Bear. I had a killer burger and if you need any more enticement, check out this slice of cheesecake that Ed polished off after dinner! See you guys next time and thanks for the memories! Glad you enjoyed the Rye Harvest Ale, however it was the last of the batch so none in your sixer this time :( I'll be remaking it this summer, so you can have some then. Please note...I was not hired (yet...fingers crossed). I am just helping around the brewery and learning the ways of the buddha! I might note that Cigar City does not call Sea Bass a black saison. They in fact just call it a dark farmhouse as shown on the bottle. But I'm glad you finally enjoyed something by them. Wait until Vuja De comes out down here. That is the true collaboration of Cigar City and Saint Somewhere. Thanks a lot for the input guys. I put updates to try to correct my mistakes above. I should know better than to repeat what I hear. LOL. Anyway, it was great seeing you all and thanks for the great time!